Offutt AFB is located near Omaha, Nebraska. The host unit on base is the 55th Wing, the largest wing of the Air Combat Command. 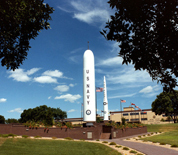 It serves as the headquarters for the Air Force Weather Agency and the US Strategic Command. Offutt is the location of the bunker where President Bush was relocated to after the 9/11 attacks. Omaha is the largest city in Nebraska. It is home to the Henry Doorly Zoo and the historical Old Market. This Offutt AFB directory features the critical info you’ll need to navigate through the many facilities and recreational opportunities available on base.